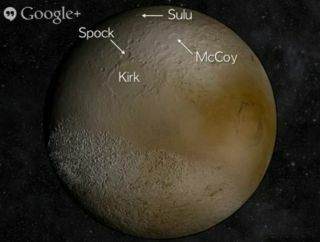 Some craters and other surface features spotted on Pluto by NASA's New Horizons probe in 2015 may end up bearing the name of "Star Trek" characters, as this screenshot from a Google+ Hangout demonstrates. While the naming gods have swatted away an attempt to christen one of Pluto's newfound moons "Vulcan," the "Star Trek" universe may still leave its mark on the dwarf planet soon enough. After NASA's New Horizons spacecraft gets the first up-close views of Pluto in 2015, craters, mountains and other features spotted on the dwarf planet's surface could bear the names of famous "Star Trek" characters, researchers said. Craters and other features spotted on Pluto by NASA's New Horizons probe in 2015 may end up being named after Mickey Mouse and other Disney characters, researchers say. Showalter led the team that used NASA's Hubble Space Telescope to discover Pluto's two smallest known moons, which were announced in 2011 and 2012 with the pedestrian names P4 and P5, respectively. P4 is thought to be 8 to 21 miles (13 to 34 kilometers) wide, while P5 is tinier still at 6 to 15 miles (10 to 25 km) across. The SETI Institute sponsored an online poll called Pluto Rocks to come up with better monikers for the two natural satellites. The runaway winner of the poll was Vulcan, which snagged 170,000 of the nearly 500,000 votes cast after it was suggested by actor William Shatner (who played Capt. James T. Kirk in the original "Star Trek" TV series). In the "Star Trek" universe, Vulcan is the name of both a planet and the pointy-eared beings who evolved there. However, the International Astronomical Union — the organization responsible for naming celestial objects — nixed the name. The IAU accepted the second- and third-place finishers in the Pluto Rocks poll, so P4 and P5 are now officially known as Kerberos (the three-headed dog that guards the gates of the Underworld) and Styx (the river separating the land of the living from that of the dead), respectively. Some of the other candidates from the contest will likely find new life as the names of Pluto surface features spotted by the New Horizons probe, which is slated to fly by the dwarf planet in July 2015. For example, Showalter said that if a large mountain exists on Pluto, it should bear the name of Sisyphus, a human condemned for all eternity to push a boulder up a hill, only to watch it roll back down again. Scientists have much more freedom in naming the surface features of planets and moons than they do in attaching monikers to the celestial bodies themselves, Showalter added. So craters, valleys and plains may get all sorts of interesting names, some of them of much more recent origin. "We know there are a lot of fans out there of the animated works of Walt Disney, and I'm hoping that someday Pluto will give us a place in which we can put the name of Mickey [Mouse] into the Pluto system as well," Showalter said. Pluto has five known moons. The largest by far, Charon, was discovered in 1978. Hubble detected the other four, finding Nix and Hydra in 2005, Kerberos in 2011 and Styx in 2012. There could be more Pluto satellites out there waiting to be discovered and named, however. "I wouldn't be at all surprised if we pick up a few more as the New Horizons spacecraft gets a little closer," Showalter said.